🚑 If you're in D.C., join Caitlin Owens and me for an 8 a.m. breakfast (different flavors of overnight oats!) about the future of health care, featuring Sen. Chris Murphy of Connecticut, House Freedom Caucus Chair Mark Meadows, and Ohio Attorney General Dave Yost, who this week jumped into an "Obamacare" case. 1011 4th St NW; RSVP here. 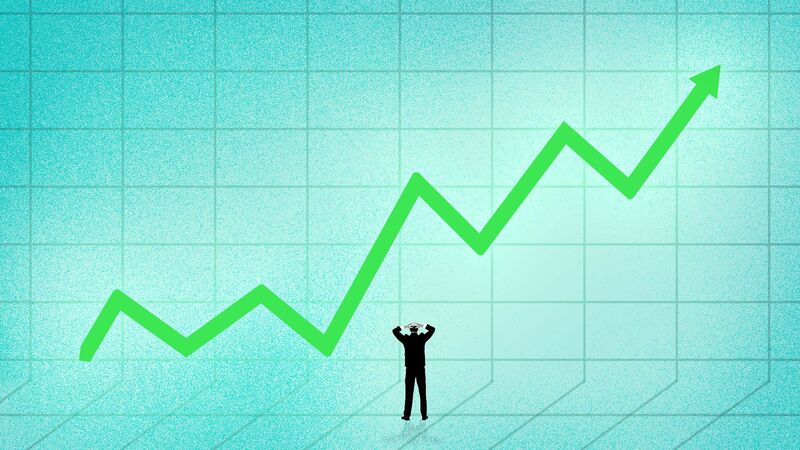 Pursuing boom-era returns, stock market investors and huge pension plans are chasing just about any growth story, regardless of whether the underlying company actually makes money, Axios Markets Editor Dion Rabouin reports. Why it matters: The market demand — which is creating sky-high valuations for companies like Lyft, Uber and Airbnb — is akin to the housing bubble in the early aughts, says Karl Dasher, CEO and co-head of fixed income at investment firm Schroders. "The last time we saw that in fixed income was the housing crisis," Dasher told Axios during a media reception at the company's headquarters." A stunning stat: Last year, 81% of American companies were unprofitable in the year leading up to their public offerings, according to data from Jay Ritter, a University of Florida finance professor. The unprofitable companies are so far outperforming the profitable ones— with median returns of 120% on an annualized basis from their IPO price, vs. 57% for companies that generated a profit. 💰 Sign up for Dion Rabouin's morning newsletter, Axios Markets. 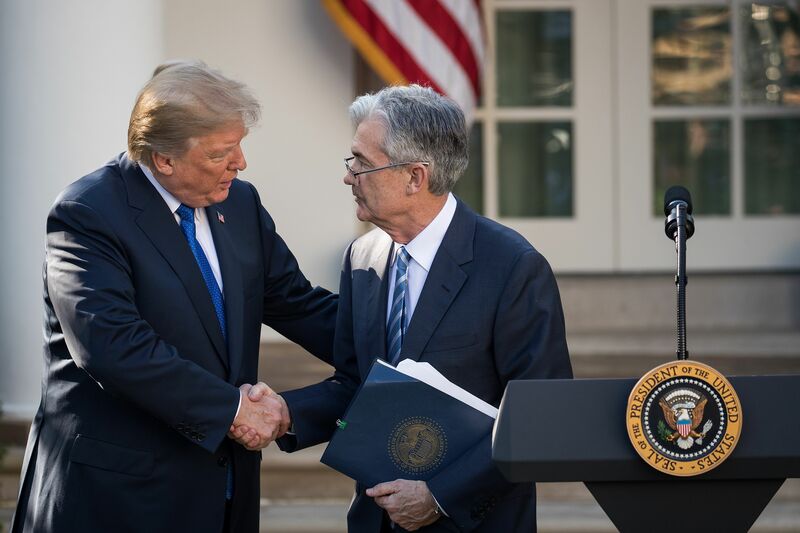 President Trump talks about the appointment of Federal Reserve Chairman Jerome "Jay" Powell as one of the great mistakes of his administration, and wanted to fire Powell late last year, Jonathan Swan reports. For a brief moment toward the end of last year, Trump mused about whether he could replace Powell with Kevin Warsh, a former Fed governor and aide to President George W. Bush, two sources tell Swan. 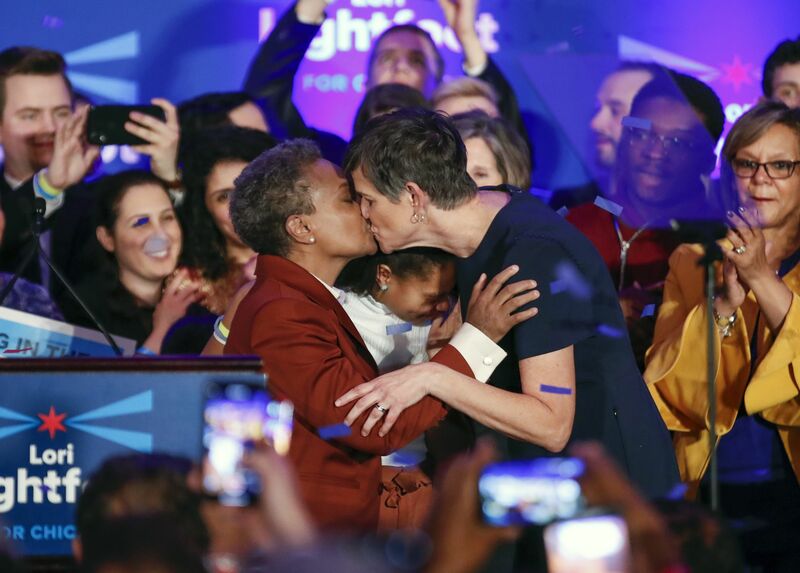 Lori Lightfoot won a resounding (74% to 26%) victory last night "to become both the first African-American woman and openly gay person elected mayor of Chicago," the Chicago Tribune's Bill Ruthhart writes. 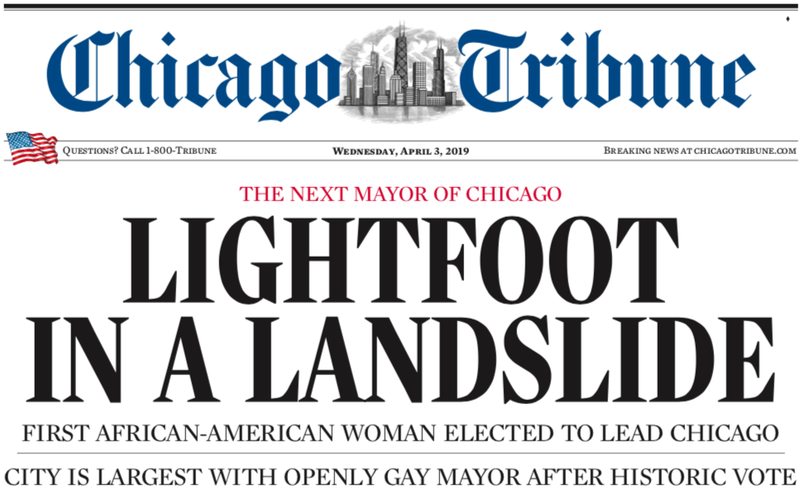 Why it matters: Lightfoot's victory over another black woman was "a stinging defeat to a political establishment that has reigned over City Hall for decades." "Lightfoot dismantled [a major cog of the vaunted Chicago political machine] by dispatching Cook County Board President Toni Preckwinkle." 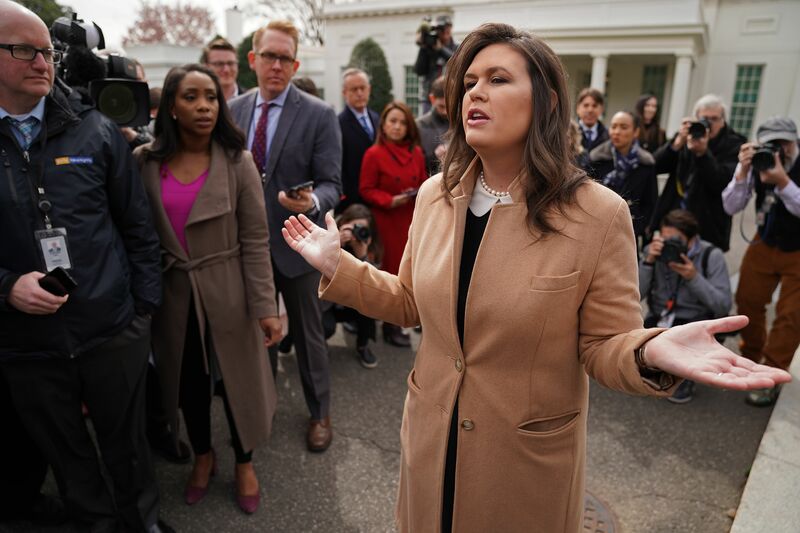 After an interview with Fox News, Sarah Sanders takes questions outside the West Wing yesterday on immigration, Mueller and more. 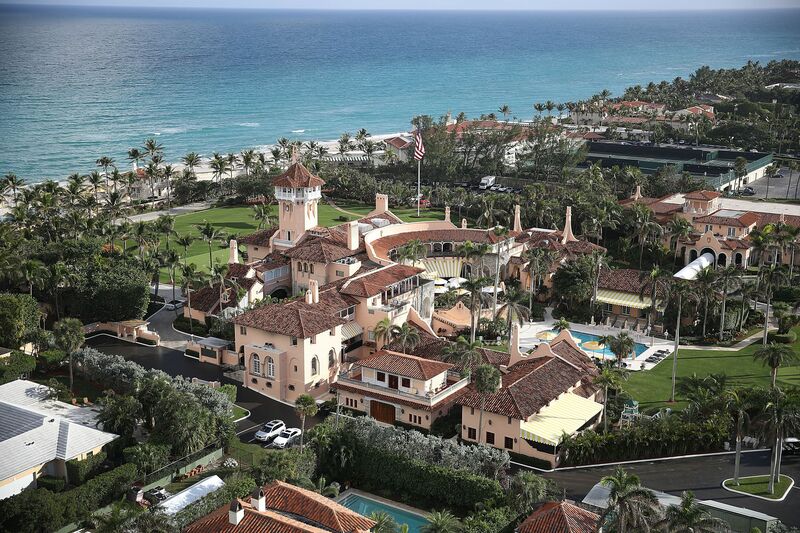 Secret Service agents arrested a Chinese woman who bypassed layers of security and gained access to the reception area of President Trump’s Mar-a-Lago resort this weekend, the WashPost's Devlin Barrett and David Fahrenthold report. She was carrying two passports, four cellphones, a laptop, a hard drive and a thumb drive containing "malicious software," according to court documents. "The president was in south Florida that afternoon, golfing nearby." Why it matters: "The incident renews concerns about how secure the president and his advisers are during their frequent stays" at his club, open for members and guests when the president is there. Those totals are expected to lead the Democratic field. Sen. Kamala Harris put up an impressive $12 million. But the biggest winner may be Pete Buttigieg, who called his $7 million "a great look for our first quarter." The others have yet to announce Q1 totals. Track every 2020 candidate's Q1 fundraising. 7. "Do you feel proud of what's happening between 8 and 11 every night?" 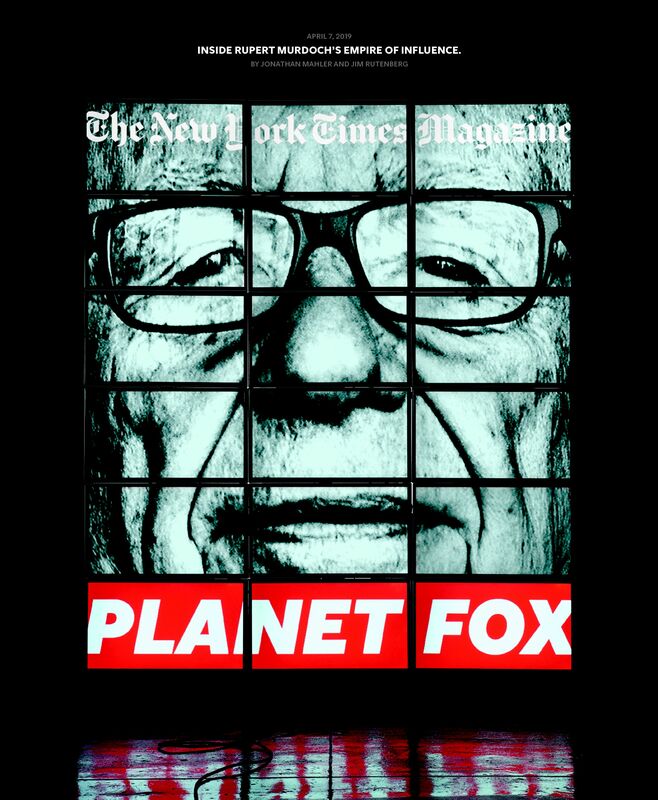 "Few private citizens have ever been more central to the state of world affairs" than Rupert Murdoch. "As friends of the Murdochs liked to say, Murdoch didn’t raise children; he raised future media moguls." During the 2016 campaign, when conservative commentator Steve Hayes called Donald Trump "a clown" on a Fox News roundtable, Trump faxed anchor Bret Baier his résumé, with a note scrawled in black marker: "Tell Hayes no clown could have done all this!’"
"On Fox's prime time, Mueller’s decision against bringing new indictments was portrayed as vindication of what the hosts had been telling the audience all along." "The 2020 campaign and the new era of the Murdoch dynasty had begun." 8. First look: Progressive push for "monopoly tax"
The Center for American Progress (CAP) is going in big on the antitrust debate, with a proposal aimed at putting meat on the bone of the policy discussion for both progressives on the Hill and the campaign trail. Recognizing that the implementation of some or all of these policies may provide incomplete solutions to competition problems, the authors ... explain how a monopoly tax, levied on companies that earn profits in uncompetitive markets, could reduce the incentive to create market power and limit the revenues that can be used to sustain existing entry barriers. Former Ohio Gov. John Kasich has formed a center-right, Ohio-based group, Two Paths America, to promote solutions that he considers more positive than President Trump and more modern than Ronald Reagan. Tom Davis, Charlie Dent, Jennifer Horn, Bob Inglis, Bill Kristol, Tom Rath, Arnold Schwarzenegger, Rick Snyder and Christine Todd Whitman. The board also includes California Assemblyman Chad Mayes (formerly Republican leader), and Steve Luczo, chairman of Seagate Technology. Online companies are delivering pre-proportioned meals of meat and vegetables or frozen raw meat. This spring, Petco will open a kitchen in New York where it expects to make 2,000 pounds of fresh pet food every day. U.S. sales of fresh pet food in groceries and pet stores jumped 70% between 2015 and 2018, to more than $546 million, according to Nielsen. That doesn't include online sales or people making their own fresh pet food. Some vets are skeptics, saying packaged food is backed by decades of research. And the FDA warns that raw meat has a higher risk of contamination.